Muggles everywhere can’t get enough of the Wizarding World of Harry Potter. 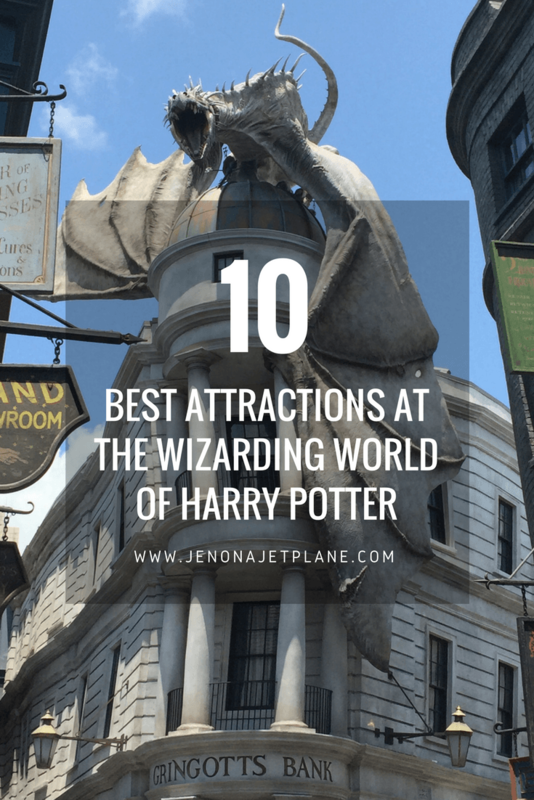 Whether lifelong fans of the series or newcomers to the story, there’s something for everyone at what’s quickly become the number one rated theme park in the Orlando area. 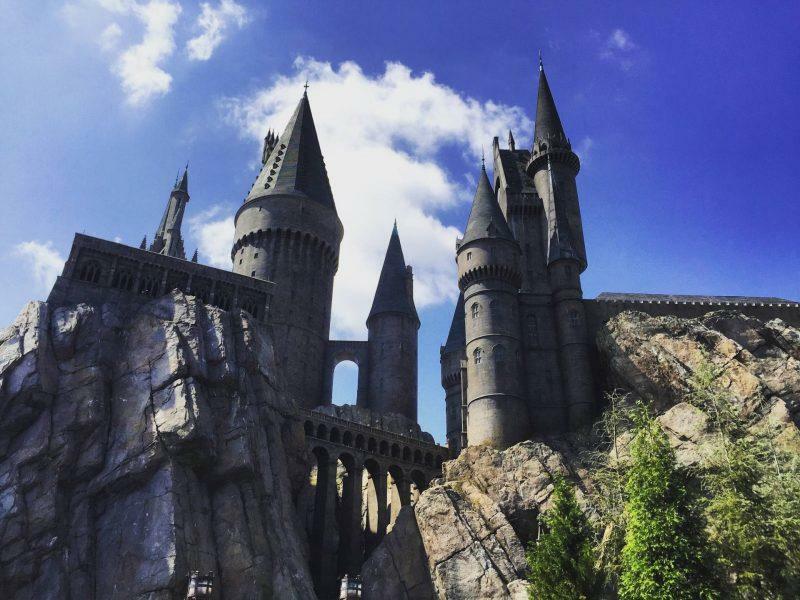 What exactly makes Harry Potter stand out amongst the world’s most famous parks? I had the chance to discover for myself. 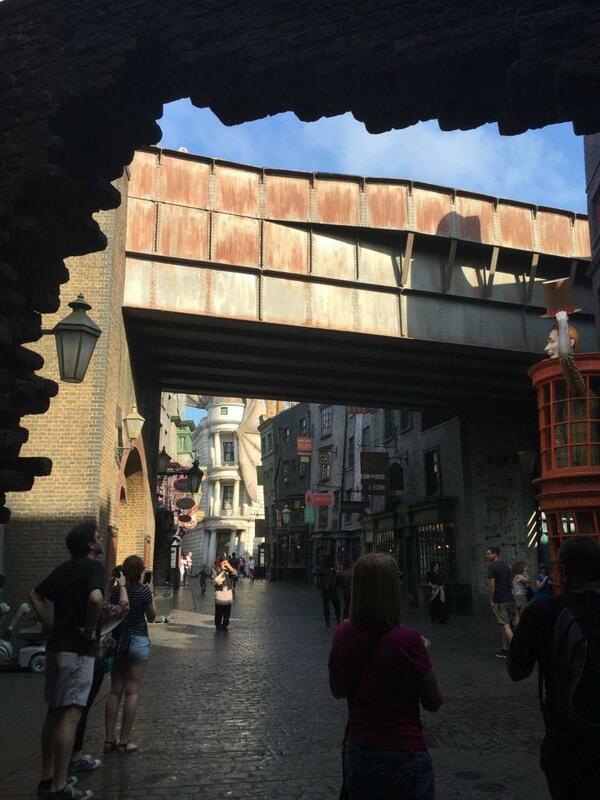 The park spans two distinct areas–Hogsmeade in Islands of Adventure and Diagon Alley in Universal Studios. 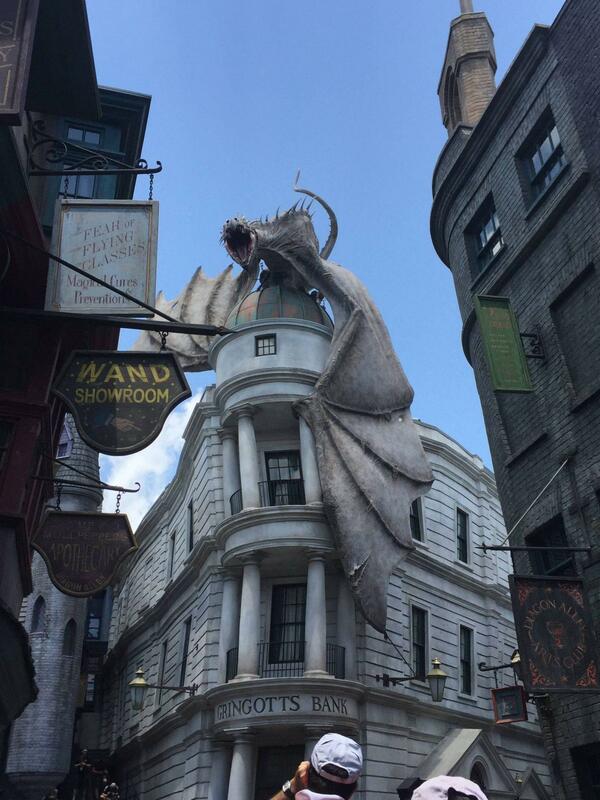 Without question, the Diagon Alley addition is the more authentic of the two. Those who originally visited just Hogsmeade in Universal might have been disappointed with its lack of curb appeal. One minute you’re strolling through the Lost Continent, the next you’re in Harry Potter World. It’s all very lackluster. In contrast, Diagon Alley is like a speakeasy that millions of people just happened to have stumbled into. Hidden behind a nondescript brick wall, just like in the books, this entrance definitely has a wow factor. There is enough to see and do in both parks to keep guests busy for days. 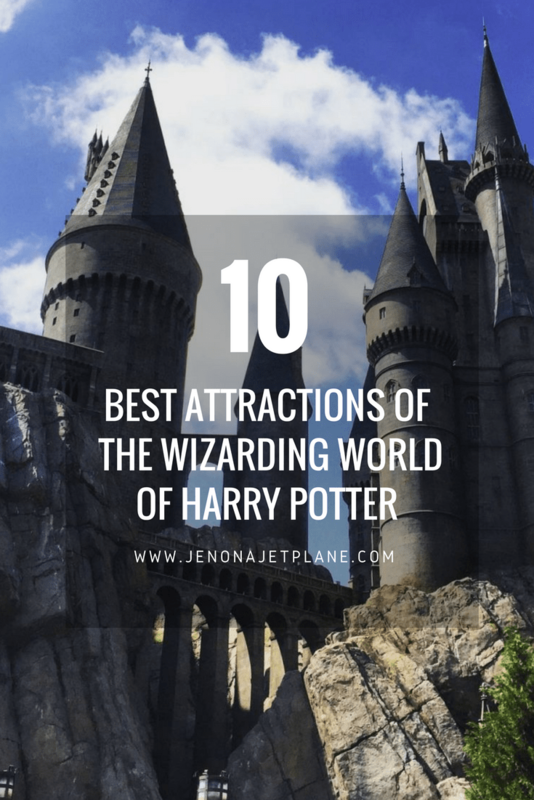 Those on a tight schedule, however, should aim to see these top 10 attractions before declaring their mischief managed! Hogwarts Castle is the main landmark of Hogsmeade in Islands of Adventure and home to Harry Potter and the Forbidden Journey, a motion simulator experience where guests can fly with Potter and friends. The line for the ride is almost more exciting than the ride itself, with surprise character appearances and the ability to get up close and personal with iconic pieces such as Dumbledore’s Pensieve and the notorious Sorting Hat. Those prone to nausea can opt out of the ride and simply enjoy the castle tour. Visit early (before 10am) or at dusk (after 5pm) to avoid the crowds. Keep in mind that wait times can easily exceed two hours at this ride during peak season. On the other side of town, Gringotts Bank is home to not only goblins, but a fire breathing dragon as well. Literally–every 10 minutes the dragon perched atop of the bank lets out a huge fireball, don’t miss it! Escape from Gringotts is another motion simulator ride, though easier on the stomach than the one in Hogwarts, possibly because your legs aren’t dangling. 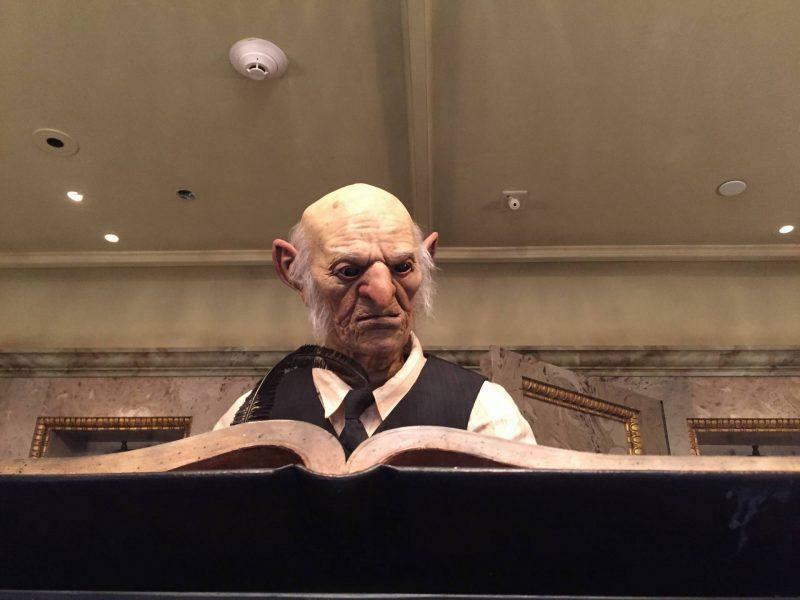 Guests enter through the bank lobby, adorned with a giant chandelier, marble floors and very realistic looking goblin tellers. Then you descend to the vault area to join Harry and crew on a heist. There is a single rider line with reduced wait times but it bypasses the main lobby, which is worth seeing. Given the popularity of this ride, I recommend making it your first stop. 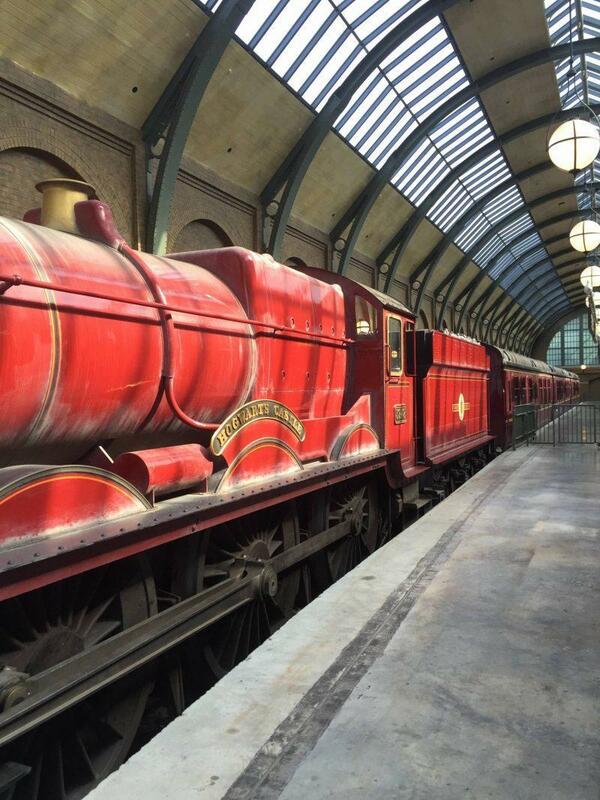 If you want to hop aboard the Hogwarts Express, you’ll need a park hopper ticket. A one-day upgrade is costly at $50 more per person, but the convenience is unparalleled. The train drops you off directly in front of both Harry Potter areas, so you remain immersed in the magic all day long. Guests enter Kings Cross Station and pass through Platform 9 3/4 before settling into a train compartment with 4-6 other passengers. There are two separate shows projected onto the windows of the train depending on which way you’re traveling, and you’ll see familiar figures pass by the cabin doors, including the candy trolley and even he-who-must-not-be-named. Lines get very long in the afternoon, so aim to do your park hopping early in the morning, ideally while knocking out the first two rides. Are you a wizard in training? 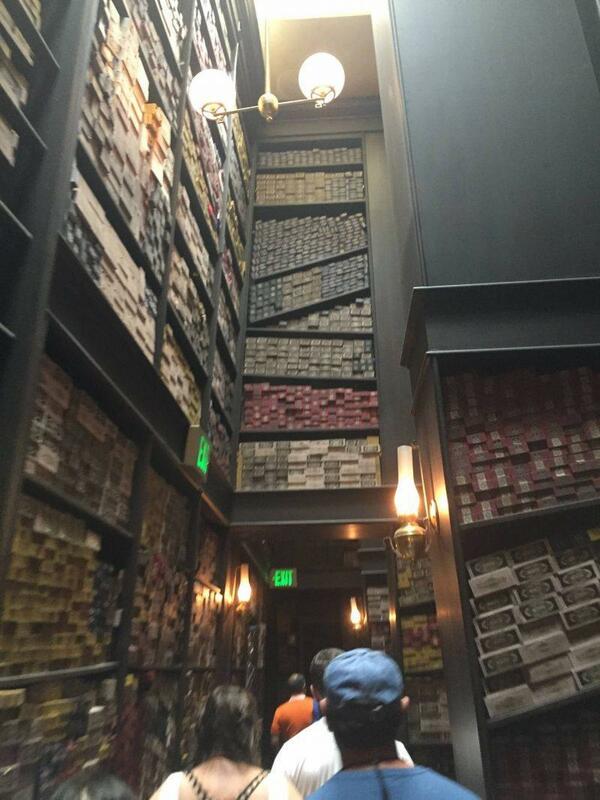 Then you need your very own wand, and there’s no finer place to get one than Ollivanders. Thankfully, with storefronts in both parks, this is a convenient and, importantly, air-conditioned afternoon activity that the whole family can enjoy. Guests attend a selection ceremony with 10-20 other people, wherein one special audience member is chosen to receive a custom wand. There are special effects involved, including a dramatic spotlight and chorus moment when the fated wand is chosen. Diagon Alley has 3 showrooms versus just 1 in Hogsmeade, but the wait at either will generally run you about 15 minutes. If you’re an adult who holds sincere hopes of being selected, aim for the Diagon Alley location since Hogsmeade almost exclusively selects young children before masterfully ushering out their parents to foot to bill. Also, if you’re buying a wand, you may as well spring for an interactive version. It costs roughly $10 more but has the added benefit of allowing you to cast spells throughout the parks. Ditch your credit card and use the local currency instead. 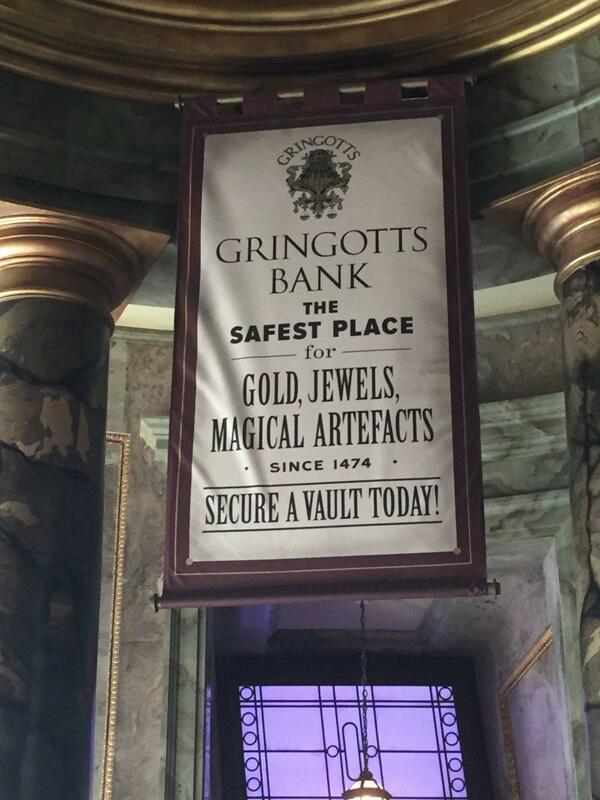 Stop by Gringotts Money Exchange, just outside Gringotts Bank, to covert your dollars to certified Gringotts Bank Notes that are valid throughout the resort. Make sure to talk to the animatronic goblin teller. Don’t make the mistake of confusing him for a house elf—he can hear you! 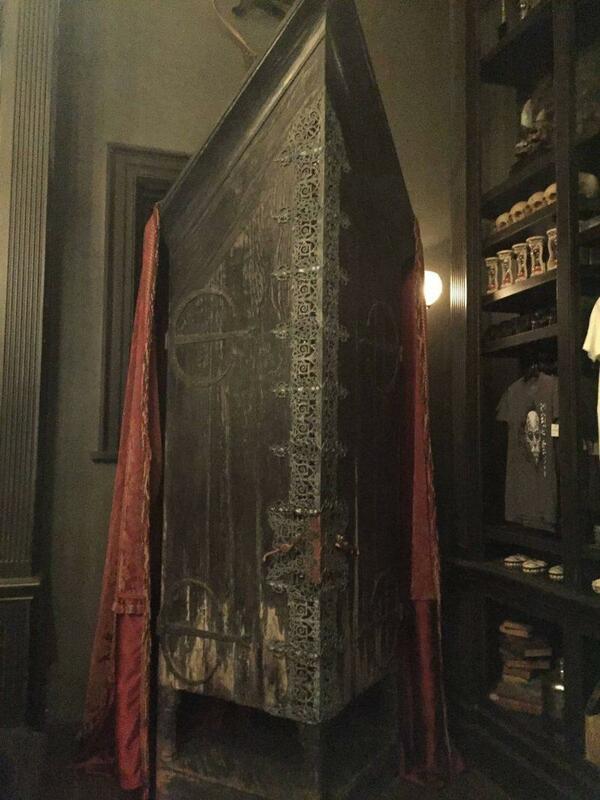 Walk over to Madam Malkin’s Wizarding Attire for your robes and uniforms. It’s not uncommon to see guests dressed in full character despite 90 degree weather. Weasley’s Wizarding Wheezes is filled with gag gifts and toy demonstrations. Honeydukes in Hogsmeade has every treat you can imagine, from chocolate frogs to Bertie Bott’s Every Flavor Beans. Dervish and Banges is home to the Monster Book of Monsters. It bites and is caged for your protection. Finally, visit the Owl Post to get any letter, envelope or postcard stamped and mailed out with a special Hogsmeade postmark. Intrigued by the dark arts? Take a stroll down Knockturn Alley. Cold, damp and dreary, those who dare enter are greeted by the mad faces of Frenrir Greyback and Bellatrix Lestrange. There are secret interactive wand locations throughout the corridors—look for rays of black light to reveal hidden spells on your map. While there’s only one store, Borgin and Burkes, it is a hub for all things creepy, including Tom Riddle’s diary, horcruxes, death eater masks and skulls of all shapes and sizes. A vanishing cabinet is tucked away in the corner and guests who press their ear to the door can hear a bird aflutter within. It’s the canary Draco Malfoy used to test that very same cabinet before using it to sneak in Death Eaters to Hogwarts. Located in Hogsmeade, this wooden coaster is a short ride, more appropriate for children. 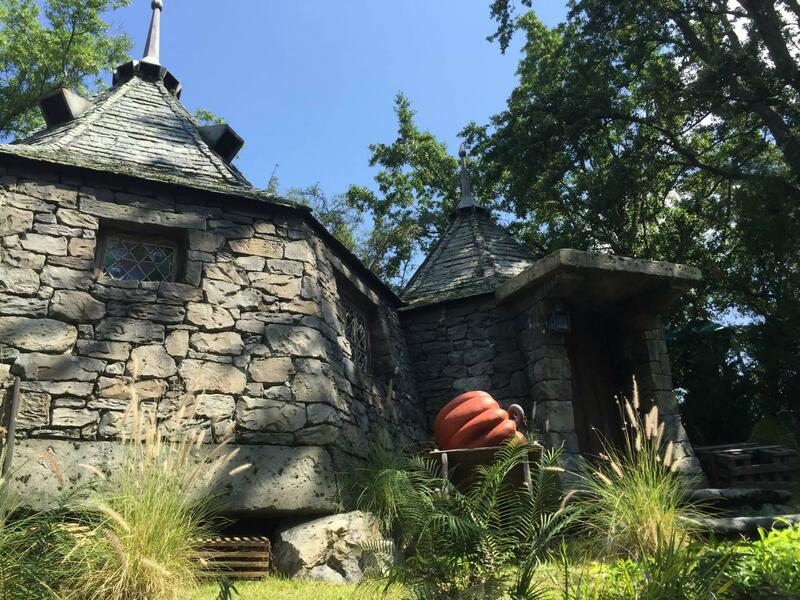 But Hagrid gets so little coverage in the park, with a guest appearance the Hogwarts Express videos, that it’s nice to pay him tribute by passing by his hut. Those who want to see the Whomping Willow can go to the neighboring and more adult coaster, Dueling Dragons. Update: Dueling Dragons turned to Dragon Challenge which turned into a TBA Harry Potter ride which will be revealed in 2019. For now it’s closed while they build but I will keep you guys posted! What’s better than an interactive, animated shrunken head? Not much. 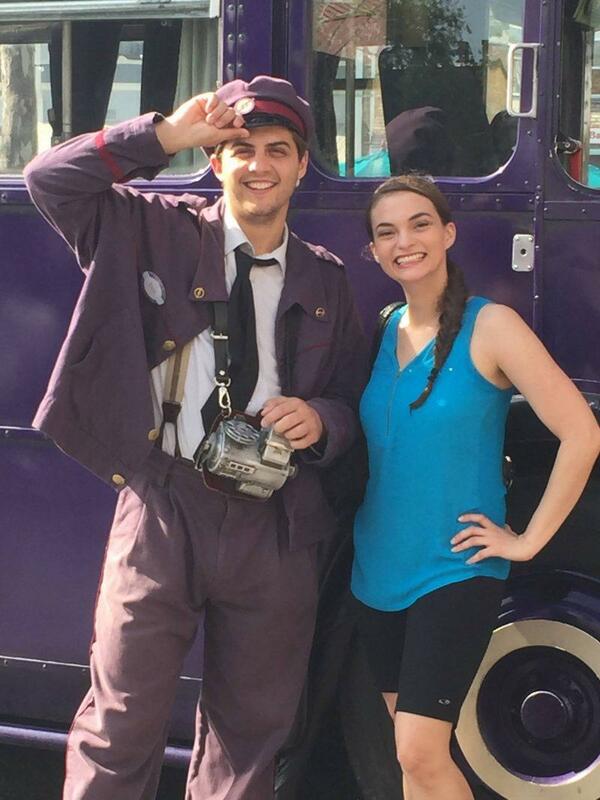 Harry Potter fans will get a kick out of meeting the conductor of the famous Knight Bus, which is known for its bumpy rides and ability to squeeze between impossible buildings. It’s one of the top three means of wizard transportation, after flying and floo powder of course. If you find yourself in queue on a hot afternoon, pass the time by entering the nearby phone booth to hear a pre-recorded message from the Ministry of Magic. Butterbeer has evolved since the park first opened and is now offered in five forms: frozen, ice cream, hot, regular and fudge. 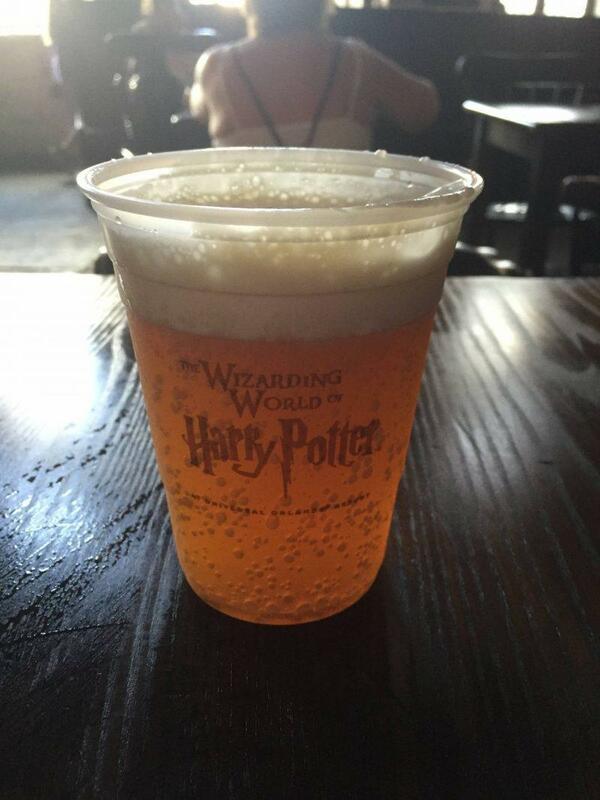 There is nothing like the classic butterbeer, a refreshing cold drink made to taste like a cream soda and topped with a butterscotch foam on top. You can purchase the drink in a plastic cup or collectible mug, though the collectible mug does not offer any free or discounted refills. Ice cream is very popular in the park on hot days, and instead of waiting long lines at Florean Fortescue’s Ice Cream Parlour, aim for a butterbeer ice cream at a corner stand. Available only in the winter, the hot butterbeer is described as a butterscotch laced latte, and the Fudge is available at Honeydukes. While I wouldn’t recommend trying all 5 in one day, there’s certainly more than enough Butterbeer to eat, drink and be merry. 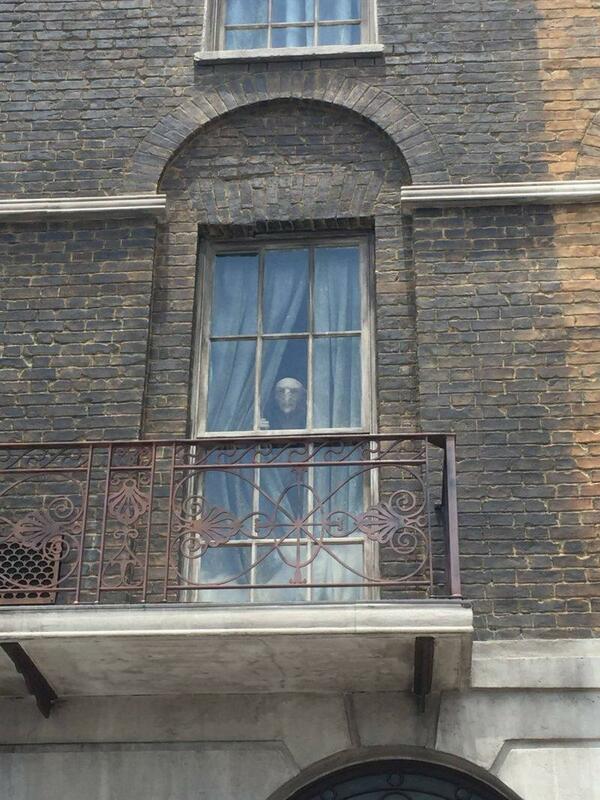 While he’s not exactly friendly, you can’t leave without stopping by 12 Grimauld Place to wait for Kreacher the house elf to make his periodic appearance, once every few minutes. After all, what would the Wizarding World of Harry Potter be without the house elves that keep it all running smoothly behind the scenes? I hope you all have a magical time on your visit to the Wizarding World of Harry Potter. Feel free to comment below with any feedback or questions. There is just soooo much there, it’s amazing!! I totally agree though – Hogsmeade is kind of plonked in like every other part of the park (which is still amazing, but … it’s a little weird hearing the Jurassic Park theme while looking at Hogwarts, right?!). They’ve got Diagon Alley spot on though! I loved the whole London area, and I love all the little “easter eggs” like calling the Ministry Of Magic from the phone box, using wands to do things, Knockturn Alley, it’s all just fab! Aaaaand now I want to go back. I absolutely LOVE this place and it was an absolute pleasure visiting in May. Not a Harry Potter fan but I thoroughly enjoyed it. My favorite part was the dragon spitting real fire at the Diagon Alley. Absolutely phenomenal! Thank you for helping me relive the memories. Great post too! Wow! I never actually realized that there is so much of the book that has been turned into reality. J. K. Rowling is really impressive and her imagination is mind blowing… Literally! I would love to visit and live through the world. Sigh… Maybe not a reality. I’ve never been but I am a huge Harry Potter fan. The theme park never interested me until now. I will have to go there some day because it looks like a lot of fun. I absolutely love this! I want to go visit so bad!!! I can’t believe you can actually see as much as you can and in real life. This makes me love Harry Potter all that more. She really developed these characters into people we can completely relate to which is why I love that they provided so much to their fans. It provides so much hope, imagination and creativity. I’m certainly not the biggest Harry Potter fan, though I did enjoy the movies. And I would still absolutely love to visit! It’s so much about fantasy and being part of something you feel you know because you’ve seen the movies so many times…strange and familiar. How does that work? I hope I get the change to go sometime! I am so happy I read this. My boyfriend has been trying to get me to go to Orlando for years, he’s just convinced me to change our New England Fall Road Trip (cries to self) to go to Orlando. I love Harry Potter so reading this has made me feel much better with the decision. Ahhhh 😍😍😍 you’re post has gotten me all giddy inside hehe. Need to go here asap!!! Oh wow, this looks like so much fun! I’ve never actually seen any of the movies but this looks like it would still be fun to do. Hi Lauren! You have options, Orlando is filled with hotels especially around the theme park area. Anything on site is not budget friendly, so staying off site is your best bet. Most local hotels provide free transportation to the parks. I’ve stayed at the Holiday Inn or Days Inn — any hotel on sale that weekend basically — and have had no issues! Just make sure you’re looking for places with Universal as the main nearby attraction. These are all great tips! I was there today and was curious about the gringots bank and I wanted to go back and ask the goblin more questions! Now I have to trek back, luckily I bought a 4-day ticket and have 2 hrs in the morning!